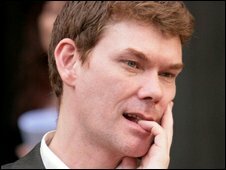 British hacker Gary McKinnon has lost his latest High Court bid to avoid extradition to the United States. The US wants to try the 43-year-old, from Wood Green, north London, for what it calls the biggest military computer hack of all time, in 2001 and 2002. Mr McKinnon admits hacking, but denies it was malicious or that he caused damage costing $800,000 (£487,000). Whether or not he can appeal to the UK Supreme Court will be decided at a later date, Lord Justice Burnton said. He said it was a matter which should be dealt with "as expeditiously as possible". Glasgow-born Mr McKinnon had challenged refusals by the home secretary and the director of public prosecutions (DPP) to try him in the UK. The home secretary insists he has no power to demand the trial take place in the UK. The DPP refused to order a UK trial, saying the bulk of the evidence was located in the US and Mr McKinnon's actions were directed against the US military infrastructure. He had also asked the court to rule on whether his Asperger's Syndrome meant he could not be extradited to the US. His lawyers argued extradition was "unnecessary, avoidable and disproportionate" and had not taken place in other cases. But, in a 41-page ruling, the judges said extradition was "a lawful and proportionate response to his offending". Home Secretary Alan Johnson said: "Mr McKinnon is accused of serious crimes and the US has a lawful right to seek his extradition, as we do when we wish to prosecute people who break our laws. "The court judgement has also made absolutely clear that the DPP's decision not to prosecute in the UK was the right one. "My predecessor has already sought and received clear assurances from the US that Mr McKinnon's health and welfare needs would be met, should he be extradited. "It is open to Mr McKinnon to seek to appeal to the House of Lords." Mr McKinnon faces up to 70 years in prison if convicted in the US of what prosecutors have called "the biggest military computer hack of all time". He has always insisted he was looking for classified documents on UFOs which he believed the US authorities had suppressed. Speaking outside the High Court, his mother, Janis Sharp, said her son - who did not attend court - had been "naive enough to admit to computer misuse without having a lawyer and without one being present". To extradite an American from the US, British must prove "probable cause"
"We are heartbroken. If the law says it's fair to destroy someone's life in this way then it's a bad law." She said she feared for his health. "He's very ill, he's got really bad chest pains, it's affected him emotionally, mentally, every way, he's terrified," she said. Ms Sharp appealed directly to US President Obama to intervene in the case. "Stand by us and make this world a better place, a more compassionate place," she said. "Obama wouldn't have this. He doesn't want the first guy extradited for computer misuse to be a guy with Asperger's, a UFO guy. He wouldn't want this. "I'm just praying, please hear us, Obama, because I know you would do the right thing," she added. 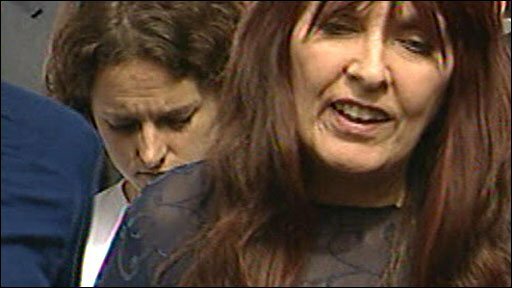 In a statement, his lawyer Karen Todner, asked: "What does it take to make this government sit up and listen to the clear public view that Gary McKinnon should not be extradited? "The extradition treaty with America was brought in to facilitate the extradition of terrorists and it must be clear to anyone following this case that Gary McKinnon is no terrorist. "Why aren't they stopping the extradition of a man who is clearly vulnerable and who on the accepted evidence suffers from Asperger's? "Gary is clearly someone who is not equipped to deal with the American penal system and there is clear evidence that he will suffer a severe mental breakdown if extradited." Mr McKinnon accessed 97 government computers belonging to organisations including the US Navy and Nasa. In February the Crown Prosecution Service refused to bring charges against Mr McKinnon in the UK. The decision followed a ruling last October by then Home Secretary Jacqui Smith to allow his extradition. Mr McKinnon has already appealed unsuccessfully to the House of Lords and the European Court of Human Rights and his latest judicial reviews in the High Court are likely to be his last chance. His lawyers say the authorities have not given proper consideration to his Asperger's Syndrome, which could have "disastrous consequences," including suicide, if he was to be extradited. They argued he was "eccentric" rather than malicious and should be tried on lesser charges in the UK to protect his mental health.